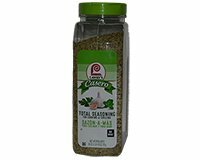 Lawry's Casero Total Seasoning is a delicious blend of herbs and seasonings including Garlic, Oregano, and Cilantro that gives authentic homemade Latin flavor to your meals. Ingredients: Salt, Garlic, Spices (Including Oregano, Parsley, Cilantro), Yeast Extract and Silicon Dioxide and Calcium Sterate (to make free flowing). In a large bowl, coat chicken and vegetables in olive oil then sprinkle with Lawry's Casero Total Seasoning. Line a large baking sheet with non-stick foil, then arrange chicken and vegetables in a single layer to cook evenly. Roast in oven for 30 minutes, then turn once and roast for an addition 15 minutes (or longer until chicken reaches internal temperature of 165° F as measured with a meat thermometer).